About freedom of speech and the destruction of local media – here is Poland. Can a small Polish radio station reaching 3 million inhabitants of Warsaw and the surrounding area, as well as American Polonia in Illinois, count on help? It is important that not only is freedom of speech threatened, but also the possibility of running any kind of business. Unless it is in accordance with the ruling party’s position. Freedom of religion, press, speech, petition and assembly is the first amendment to the US Constitution that forms part of the ‚US Bill of Rights’, i.e. ten amendments from 1789-1791. It has been one of the cornerstones of American culture and politics for more than 200 years. Censorship does not exist, and any attempt to introduce it is met with strong resistance and defence and the decisions of the U.S. Supreme Court. One could say that it was in the United States where the words of Evelyn Beatrice Hall, attributed to Voltaire, were made real: „I do not agree with your views, but to the end of my days I will defend your right to proclaim them”. Listing articles [links only] created during the last 6 months that would refer to Poland would take many A4 pages. Waste of paper. Very often in official speeches, press articles or historical books it is emphasized that Poland was the first country in Europe where the principle of tolerance reigned, that the Republic of Poland was a role model for other countries. There are two remarks of historical nature: first – the first such country in Europe was the Emirate of Córdoba, a Muslim country on the territory of today’s Spain, where religion didn’t matter; it is quite enough to say that – second – in Christian Europe, the Polish-Lithuanian Commonwealth, i.e. Poland was indeed such a country, but it only lasted 150 years and ended 300 years ago; and the United States will only be created a hundred years later. The experiment with freedom did not go very well. Let’s return to Poland and its history. During the so-called partitions, when Poland disappeared from the map of the world, after the rebirth of 1918 and the times of the Second Polish Republic, and finally after the Second World War, when the communists ruled there was no freedom of speech, tolerance did not exist, but censorship – was present. Although communism is said to be collapsed in 1989, this does not mean that tolerance prevailed, and freedom of speech became the country foundation. Limiting the right to free speech still exists, although undoubtedly not to the same extent as in the communist era. There are still cases when courts decide to prohibit publication. On 11 December 2017, the National Broadcasting Council imposes a huge penalty on TVN television – PLN 1.48 million – explaining it by „the broadcast unreliability”. After indignation caused by this decision, a month later the President of the National Broadcasting Council revokes the Council’s decision. I was not without meaning that TVN is one of the largest TV stations in Poland and the owner is an American company. That case became famous not only in Poland but also in the United States. Unfortunately, owners of smaller media are not supposed to count on political support from across the ocean. In 2008, after receiving a broadcasting license, Hobby Radio appears on air, a small local station which covers part of Warsaw and its northern surroundings. From the very beginning, the Radio Station has been focused on local issues and one of the programming elements concerns supporting various social initiatives, including above all those related to help people with disabilities. We have hardly any room for great politics. In 2013, Sergiej Naryszkin, Chairman of the Russian State Duma, said that „Russians value the existing interpersonal contacts and love Polish culture, and Poles – love Russian ones”. These words were said after the meeting with President Bronisław Komorowski and Marshal of the Sejm Ewa Kopacz, and 2015 was declared the year of Russia in Poland and the year of Poland in Russia. Preparations on the Polish and Russian sides begin, agreements are signed, contacts are established which are to result in meetings, concerts, film reviews, etc. and the owner of the Hobby Radio signs a long-term agreement to broadcast the „Sputnik” program, a Polish language show prepared by the Russians. Unfortunately, soon afterwards, in 2014 Russia occupies the Crimea and then the war in the east of Ukraine begins. In July 2014, the Polish government announces that there will be no Polish year in Russia and no Russian year in Poland. The atmosphere changes from day to day, there is more and more information in the media about the „Russian agency”. So far, Hobby Radio, praised for its cooperation initiative, suddenly becomes one of the flagship examples of a medium that practices and distributes Russian propaganda. However, before Radio Hobby became a „flagship example” of the medium distributing Russian propaganda, President Bronisław Komorowski granted the Radio the patronage over the Mazovian celebrations of the „25th anniversary of regaining freedom”. It was already after Russia’s aggression against Ukraine. In the changed political atmosphere, the Chairman of the National Broadcasting Council decides to revoke the broadcasting license of Hobby Radio and the NBC website announces that the Radio is broadcasting illegally. 2015 – parliamentary elections in Poland are won by the Law and Justice Party. In 2015, the Chairman of the National Broadcasting Council suspends his decision, but his successor decides to resume the proceedings for Hobby Radio to lose its license. The official reason for this is that the owner of Hobby Radio has violated the license terms as the Radio broadcasts the Russian program. In autumn 2017, a member of the National Broadcasting Council gives an interview to a radio station related to the ruling Law and Justice. In the interview he states that Hobby Radio is unreliable and that the license should be transferred to other stations. Implicitly, for example, to the radio station he is giving the interview. When the National Broadcasting Council attacked TVN television, everyone was shocked in Poland and abroad. But when the repressions affect a small local radio station, it seems that nobody is interested in it. But Hobby Radio is more than one Russian program. It is a daily five-hour program for the Polish community in the United States, programs on motorization, free support for social initiatives, especially those aimed at helping the disabled, a political and economic journalistic program whose host can hardly be accused of even minimal pro-Russian sympathies, or, finally, a program led by… a member of Law and Justice. 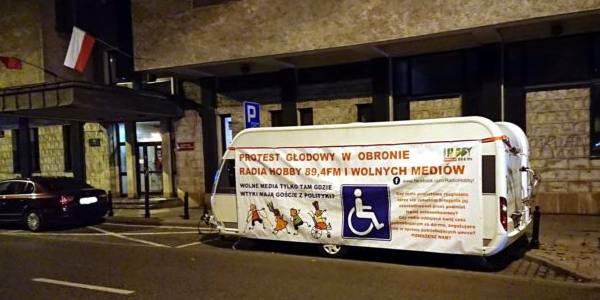 Radio Hobby is open to all political forces in Poland – politicians connected with the Democratic Left Alliance, Civic Platform, Kukiz’15 Movement, Modern, Freedom and finally Law and Justice are hosted on the air. Everyone has opportunity to speak, to present the political agenda. Without exceptions. We dare to say that Hobby Radio is the most pluralistic medium in Poland. Despite the fact that the National Broadcasting Council is still trying to revoke the Radio broadcasting license, still not the content-related assessment but the political intention of the authorities decides about the future of Hobby Radio. Is there a chance for us? Will the world’s media take a stand for our Radio as they did in the case of TVN? And at the end here are Noam Chomsky’s words: “If you believe in freedom of speech, you believe in the freedom to express views that you do not like. Goebbels was an advocate of the freedom to express views he liked. Stalin too. And if you are for freedom of speech, you are for the freedom to express exactly the views you hate”. It is indeed bizarre that the founder of the radio station carries out activities for the benefit of the disabled and socially excluded, and he agrees with the projects of Law and Justice concerning many things, unfortunately he is not a member of the Law and Justice Party and he will never be. He stays away from politics because to love Poland, God and People you do not have to engage in politics!! !